The minute you step out of your resort, you will see people of different age groups skiing off-piste. Sporting reds and blues and yellows, these skiers lend a string of colours to the snow white landscape of Gulmarg. Amidst this colourful bunch of people, you are sure to spot a few GoMissing travellers who have been visiting this quaint ski resort regularly for the past few years. Completely enamoured by its beauty, even I had been here several times. I would usually rent a hut for the entire duration of my stay and explore this beautiful town, frozen to the bone, at my own pace. But this time I wanted to see Gulmarg from a different point of view. Unlike my previous trips which were primarily about skiing, this trip had a different focus. This time I wanted to go to the heart of Gulmarg and explore its culture, its peoples’ way of life, delicacies and everything else that makes this town what it is. So off I was with GoMissing, a travel company that promised to introduce me to the real Gulmarg, and not just its slopes. On the first day itself, after some fantastic ski runs, our tour guide took us to a tea stall nearby. The place served kahwa, a traditional Kashmiri tea made by boiling green tea leaves with saffron strands, cinnamon bark and cardamom pods. Served with honey and crushed nuts, it tasted heavenly. With our guide being a native of Gulmarg, he gave us vivid accounts of the time when British officials and their families would come to this beautiful town for their summer holidays. He also talked about the kings and princes of the era gone by. Myriad other subjects were thrown into the discussion. It felt as if we were in several spatial-temporal frames at the same time. We wrapped up the evening with hot stuffed paranthas freshly off the pan. 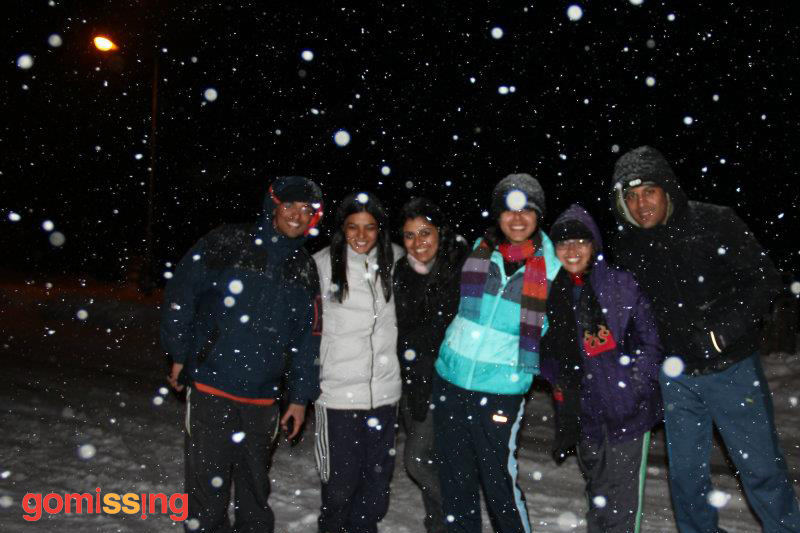 The next evening, we were on our way to explore the night life in Gulmarg. Our guide led us to this resto-bar which looked inviting. Glowing in the warmth of charcoal sigris and bukharis, it seemed to be hosting an eclectic mix of people. Within a few minutes, we discovered that local folk musicians, foodies, skiing enthusiasts and a host of other people were present here, all under one roof. The energy that this place exuded off was contagious. 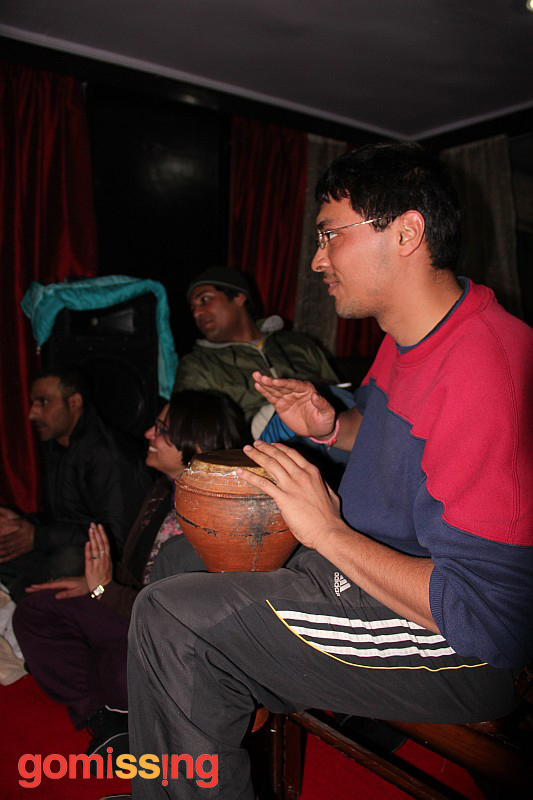 As the evening progressed, the number of people playing Kashmiri music had doubled; the sound of music – of the rubab, the tumbaknaer and other instruments became twice as intense. The next thing we knew was that we were also clapping and dancing to their beats. The evening was splendid. The place was so addictive that we went there again the next day. On the fourth and final day of our trip, we were invited for a local dinner by our skiing instructors. Though it was very much a part of our itinerary, the invitation was so warm and heartfelt that it seemed impromptu. In the evening, our cab dropped us at the destination where the entire GoMissing team was waiting for us. Huddled close to each other, we took lots of photographs, shared our experiences of Gulmarg and enjoyed, perhaps, the most delicious meal ever. 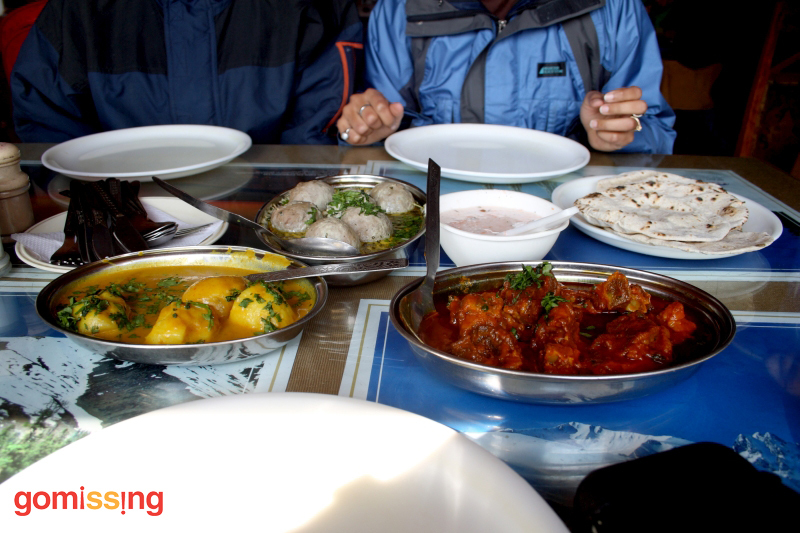 There was so much food in front of us that it was difficult to imagine that a group of skiing instructors had prepared it. Right from shammi kabab, to gushtaba, to Kashmiri pulao, you name the dish and it was there on our plate. Having basked in the warmth of the indigenous Kashmiri hospitality for over four days, we left for Delhi the next day. The trip was fulfilling to say the least!